WizKids and Paizo are teaming up for another miniatures set for Pathfinder Battles. This time around, it's Kingmaker. If you've been looking for more figures to use in your games, but they've never quite been what you were looking for, this might just be your chance to find the perfect PC or NPC representation. Pathfinder Battles: Kingmaker is the latest 45-figure set release in the award-winning Pathfinder Battles line of miniatures from Paizo Inc. and WizKids! 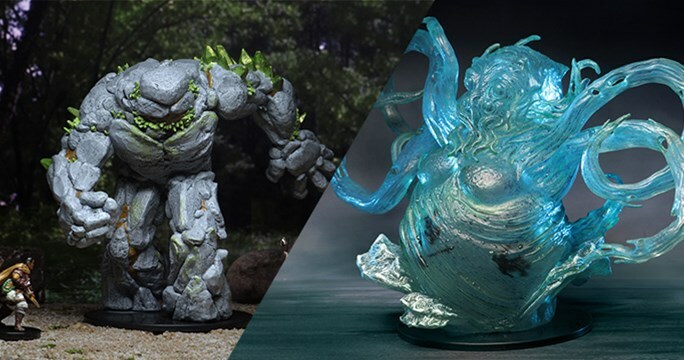 Kingmaker follows the lead of popular Pathfinder Battles sets like Jungle of Despair to provide a legion of high-utility monsters and heroes suitable for any fantasy role-playing campaign. From the disciplined Oni Mage to the deadly Soul Gorger and a special visit from Jaethal an Elf Inquisitor with a dark reputation. Make sure to keep an eye out for the rare “dungeon dressing” inserts that add realism and fun to your fantasy gaming, Kingmaker is packed with the adversaries your game is looking for. Kingmaker miniatures come in two product configurations, the Standard Booster and the Standard 8 Ct. Booster Brick.